You know the joke about New Zealand - that it's a country of 80 million sheep, four million of which think they are human - and if you go to the Agrodome near Rotorua you may just start thinking that funny line is true. For the Agrodome is all about New Zealand's agriculture and in particular those large, rather stupid wooly things known as sheep. Now if you are starting to turn your nose up at visiting such a place - don't. This is interesting for adults and kids alike and it is rated as one of New Zealand's biggest tourist attractions. Busloads of Japanese, South Koreans, Chinese, Australians, Americans, Canadians and even Kiwis turn up every day to look around the exhibits and see a very amusing - and educational - live sheep show. No, the sheep don't sing or tell jokes, but they do perform on stage as a sheep-shearing master of ceremonies tells you all about the creatures. They come on stage to order, sort of do as they are told while they are up there and you find out about the different types of wool they produce and whether or not they are good meat animals. Our own Merino ranks No.1 - as it should - but fear not the Kiwis do have their little jibes at us whenever they can. Mind you, the poor old South Koreans cop a bit of a humourous hammering too so it's all good-natured sledging. If you are brave enough you can get on stage and try to milk a cow - trying to avoid large green sloppy bits of processed grass that have unexpectedly arrived from under the bovine tail. If you manage to get some while hand-milking you'll end up with a Certificate of Udderance to prove you've actually done one of the trickiest little operations on a farm. The shearing show is something to see and if you are from the city and have never watched a guy clipping wool you can see why they have to be so fit to shear a couple of hundred sheep in a day. There is a real skill to it - plus a knowledge of some pretty nifty little pressure points that make the job easier. Sheep are pretty dopey animals, but they are also stubborn and the shearer really has to heave them about a bit to be able to get the razor-sharp cutters doing the job properly and most efficiently. Once you've seen the show you are cannot help but be impressed by the world record shearing effort of 700+ of the little brutes - all shorn in a single day. While at the show you also get introduced to the dogs that work the sheep and they are as clever as the wooly things are dumb. They obey voice and whistle commands, climb up and over the back of sheep and one even gets to round up ducks. Don't laugh, he's famous for it. At the show be sure to sit near the front so your kids can race up to join in the milking of the cow or feeding the lambs with bottles of milk. They love it. 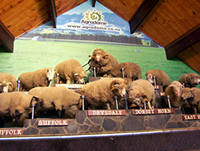 There are three sheep shows daily - at 9.30am, 11am and 2.30pm - and they are good fun for everyone. Straight after them you get to see the dogs go through a trial where they herd three sheep through gates and then into a pen. Despite being a city boy I find this coordination of dog handler and dog amazing. The Agrodome has a children's petting area called Kritterville where they can get up close with all sorts of beasties such as calves, lambs, goats, rabbits, ducks, pigs and fawns. It also offers a 45-minute guided tour over the Agrodome's 130-hectare organic farm where you can get the latest buzz on honey making, pick in-season kiwifruit (or taste kiwifruit wine). There is a new shearing shed exhibition, a chocolate factory to tour and a historic 1906 wool-carding machine from Huddersfield, Britain, that is still in working order and allows for demonstrations. Nearby the Agrodome is the adrenalin-pumping Agrodome Adventure park.